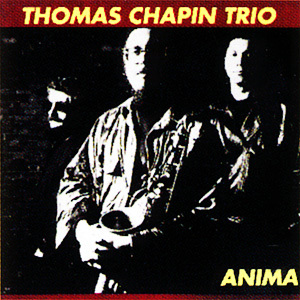 Chapin's next album, Anima, was recorded live at the Knit late in 1991, in anticipation of a US and European tour that the club was putting together for a group of its mainstay artists. All of the strengths of the previous CD had been solidified, especially Chapin's gift for bold compositions. The title track and "Seeds" are two examples of his ability to create beautiful and indelible melodies. He had grown rhythmically as well, employing a seven-beat cycle on "Anima" and "Little Machines" with total assurance, waltzing with delicacy and grit through "Native Green," mixing meters on "Hat and Shoes" and "Fez" in a manner that accentuates the details of the challenging arrangements. A surprising abundance of thematic and structural information is packed into these concentrated performances, which Chapin's knack for developmental coherence sustained in a most lucid balance. There is also a wealth of magnificent playing, including gorgeous alto flute on "Seeds." _Anima_ marks a critical transition for the trio by featuring both Steve Johns and Michael Sarin, who had become the permanent drummer by the time of the Knitting Factory tour. Sarin is a product of the rich Seattle music scene who possesses a knack for coloration and gradations of sound that quickly proved invaluable. His playing on "Hat & Shoes" finds him navigating confidently through the complex score and displaying the full range of his touch. Chapin and Pavone sensed the change that Sarin brought to the music immediately, and realized that the trio was about to realize another major step in its evolution. Recordings that the band made at the Kampo Cultural Center later in 1992 confirmed their instincts. These tracks, which form the posthumously released album _Night Bird Song_, were held by Chapin, who intended to release them at a time when he had finally captured the attention of a wider audience, when they could serve as an example of the trio at its most inspired. Once his fatal illness was diagnosed, Chapin decided that the '92 Kampo material should appear after _Sky Piece_ - the trio's final studio session - as a valedictory statement. Sarin's special character can be sensed from the opening clatter of his sticks against Chapin's alarm clock on "Alphaville." The shifting weight of Sarin's drumming, particularly on this complex track and "Tweeter's Little Adventures," reinforce the imagery at the heart of Chapin's writing. Johns had been a great drummer for the trio, and was particularly adept at creating a strong rhythmic pocket; but Sarin, who likes to locate the pocket's seam and then tug at the threads, gave the music a more three-dimensional, cinematic presence. He was also totally attuned to the pulse of Pavone's bass and the inexorable momentum of Chapin's improvisations. The _Night Bird Song_ album is also notable for placing greater emphasis on Chapin's command of so-called "miscellaneous" instruments like the alto flute and, most impressively, the challenging sopranino saxophone. He did not play this last horn for mere novelty effect, but mined it for a full range of music, getting a burnished sound on the almost Caribbean frolic "Cliff Island" (which was actually dedicated to an aunt who lived in Maine) and a contrasting quizzical edge on "Tweeter." There was more of Chapin's antic side on "Changes Two Tires," a study in hyperactivity worthy of the Road Runner, in which humor trumps frustration; more nods to Kirk (the two-sax punctuations on "Night Bird" and hollow sounds of a horn minus its reed on "The Roaring S"); more rhapsodic grandeur from Pavone (especially in his "Cliff Island" and "Aeolus" solos); and a true piece-de-resistance in "Night Bird Song," where the mesmerizing and flame-throwing aspects of Chapin's music come together in an opus that features both flute and alto sax.